Let’s be honest here, folks. 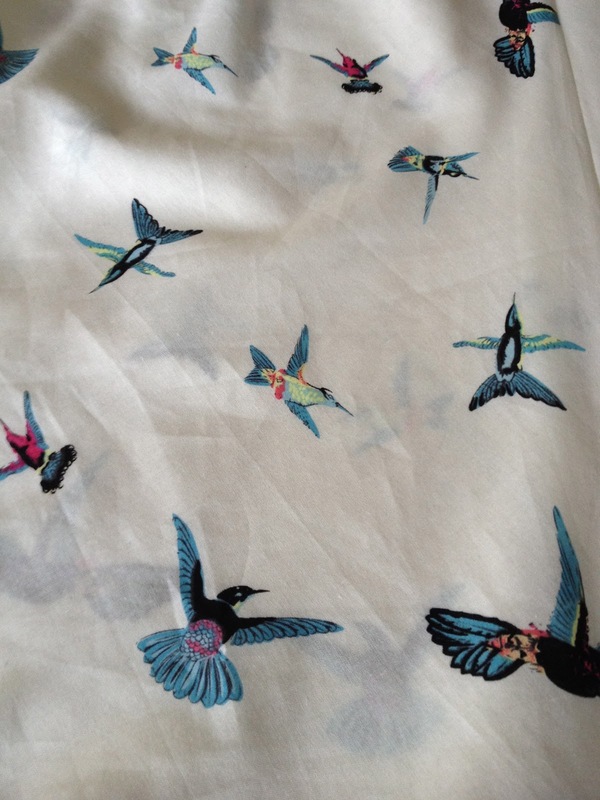 It’s fairly common knowledge that I have a weakness for prints when it comes to fabric. 50s prints. Tiny prints. Scandinavian pony prints. Are they stylish? No. Are they practical? No. Do I still make things out of them and then struggle to wear them in public? Heck yes! 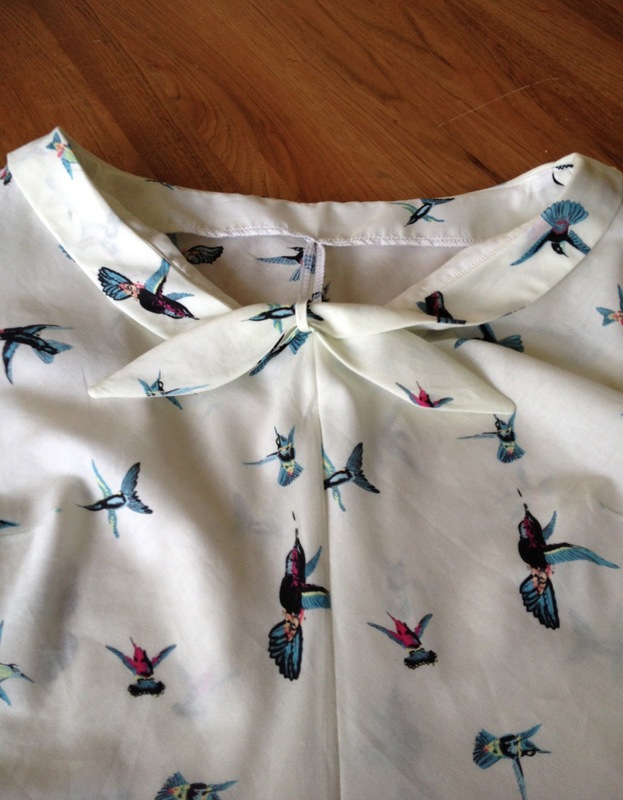 And what I am about to show you is my latest addition to my crazy print family, the rarest of beasts… The bird print! I would like to take a but a moment to point out that I really did enter Spotlight with the best of intentions. I was locked into grabbing a lovely Japanese lawn or voile to try making a Jasmine blouse with a drapey fabric. And I tried. Boy, did I try. I spent 20 minutes comparing virtues of one floral print to another and for the life of me, I just couldn’t do it. Don’t get me wrong- I love a good floral but I’m not quite sure I can pull one off. And there it was, stashed at the back, hiding in shame, my poor little bird print. And I had to give it a home. 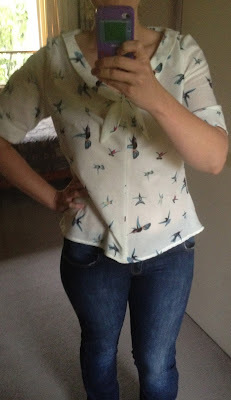 So I had another bash at the Jasmine blouse, this time using the recommended type of fabric. What I ended up with a cute, flowy summery top. Pity it is a whole 10 degrees here today. With this fabric the blouse drapes more softly and feels all swishy-swishy when I move. One of my favourite features of this blouse are the little notched sleeves. They just look so darling. Gah! When did I start using the word darling? Oh, wait. When I saw these sleeves. Zing! And I am so betting you are calling them darling too now! Now only if the weather would warm up or I sew something not made of cotton. It may be time to stash dive and see what I will make next! Oh my gosh! It’s such a darling print; nice work! I only discovered your blog the other day and it’s already costing me money- yesterday I dashed into spotty to find the little house print (I did – yay!) and now I want to go and find this one… can’t wait to see more of your garments. I’m the same… whales and kookaburras and hippos are the latest additions! I have to admit I went and sought out the tiny houses too. Now I need to decide what to do with it! Thanks, Felicity! It is one of my fave bird prints.